As you probably know if you come to my blog regularly, we are a Disney family. Whenever there is a Disney event in town, we are there. From Disney on Ice, to Disney Live, to events at our local Disney Store – you can always count on the Smith’s to be there ready to have some fun. 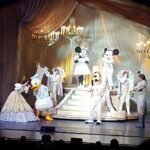 Feld Entertainment’s Disney Live: Mickey and Minnie’s Magical Doorway was just in town, and we were lucky enough to go. I knew that the whole family would have a good time, because you can’t go wrong with Disney but I had no idea just how much fun. First, let me say that we usually end up with pretty get seats for all the shows we go to. We were up in the high balcony for this one, and it was still an amazing show. I was impressed by how much Disney and the arena worked to make sure that no seat in the house was a bad one. So don’t worry if the only seats left seem like they are too far away, you are sure to have a great time no matter where you sit. Speaking of Disney working to create a great show – this show is perfect for young kids and families. It was very interactive. At the beginning, Mickey, Minnie, Donald, Goofy, and Tinkerbell teach the audience some magic words and actions which we are asked to repeat several times throughout the show to make the magic happen. My daughters have been doing that magic chant constantly since we arrived home – and it is the cutest thing. This Disney Live show is not only packed full of your favorite Disney characters, it is packed full of magic and fun. I have seen a lot of Disney shows and this one sticks out in my mind as unique. Feld Entertainment has incorporated magic tricks in to it. For example, during the Toy Story scene, a whole ton of Green Army Men pile out of a seemingly empty toy box! During Rapunzel’s segment, a woman gets sawed in half. And earlier in the show, during Cinderella’s appearance, the fairy godmother changes regular shoes (that are volunteered by someone in the audience) into sparkling glass slippers! My daughters (who are 3 and 5) were astonished by the whole thing. They loved the magic, and it warmed my heart to see them loving it so much. I could go on and on but I just don’t want to give anything else away. If you are a Disney family – or a magic fan – you are sure to love Disney Live: Mickey & Minnie’s Doorway to Magic! If you missed out this time, don’t worry, there are still many other places to check out this great show – like Rochester, NY this weekend (11/19) for my local friends! See a complete list and how to get your tickets here. 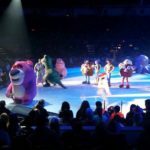 Plus, Disney on Ice: Passport to Adventure is coming to our area soon – December 14 – 18 in Syracuse and Jan 18-22 in Rochester! Discount Alert: Use the code D15WOW to save on your Disney on Ice Passport to Adventure tickets! The discount code D15WOW can be used when purchasing tickets online at Ticketmaster. The code is for $5 off P5 and P7 level tickets for the Thursday 7 p.m., Friday 7 p.m., and Sunday 4 p.m. shows.